To commence proceedings, a summons went to the "heretic" A term of grace was allowed in which a "confession" could reconcile the "heretic" to God. Reformed behavior and penance were essential for a "heretic." A Respondent to a complaint can come before the Commission and make an apology and compensation without the cost of a hearing, and hence be reconciled to the Complainant. Reformed behavior is essential for a "discriminator." “Heretics” who failed to come forward were to be denounced by good Catholics, in secret, to the Inquisitor. "Discriminators" who fail to come forward and be reconciled to the Complainant will be denounced in the media. Complaints can be made in secret to the Commission and their identity never revealed. Only witnesses of good character could testify, although "heretics" could testify against "heretics," but never for them. Only witnesses free of "racism" or "bias" or "discrimination" can be experts, although a "racist" could testify against a "racist", but never for him. A Defendant had no witnesses, as such persons would themselves be accomplices or heretics. Defendants could prove truth in the defense if they could prove their innocence. The Defendant cannot call any witness to prove the truth of what he said, because truth is not a defense. There is no defense of truth if the effect is "hate". Truth and Intent are irrelevant. Counsel, though not explicitly denied at first, was later denied by papal authority - at least for acknowledged "heretics." Lawyers who represent Defendants are labeled and libeled in the media as lawyers for "hate mongers." This is repeated until lawyer and client are seen as one. Truth, not being a defense, no intent being required, legal aid being denied, lawyers are pointless and scarce. Witnesses' and accusers' names were secret, and they were often malicious. Accusers need not testify. Their malice is considered irrelevant - and may not be questioned! After being convicted of "heresy" (sin) the "heretic" could accept penance and confess. 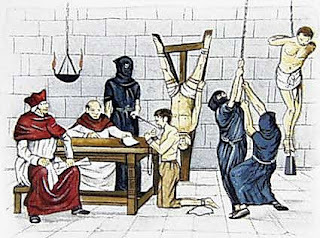 If he did not, the Inquisition never punished; it turned the "heretic" over to the civil arm for punishment for treason - usually death by burning. After being convicted of "discrimination", the Defendant or "Discriminator" may admit the "breach" and "reform" and pay money and keep quiet for life. If not, the Tribunal registers its judgment with the court, which punishes for contempt (usually jail) and property is forfeit. A confession after conviction permitted the heretic to be strangled before being burned. Property was forfeit.